About 4 weeks ago I showed photos of the Callistemon that were in bloom in my back yard. This week the photo is of a Melaleuca. According to the web site of the Australian Native Plants Society, recent research has shown the Melaleucas and Callistemons are more closely related than was previously thought and in future Callistemons may be regarded as Melaleucas. Some State herbaria have already adopted this change. The common name for the Melaleuca which I have photographed this week is Paperbark because the bark comes off in thin multi-layered pieces like paper. These trees grow to 25 meters - and that was my problem in trying to get photos of the birds. All the birds were feeding on the blossom which was way up above my head. Stepping back to get a view of the bird from the side put branches and other trees in front of the camera. A view from below was the best I could manage. The view from below made the birds look different. Lots of birds have a stripey look underneath. However, the bill was a typical honeyeater bill and there was a little bit of yellow color fading into a splash of white visible below the eye. I eventually decided that these birds were Mangrove Honeyeaters - sometimes called Variable Honeyeaters. Hopefully, I will recognize the underneath view better next time! laughing at your 'underneath' view, but i completely understand! :) at least they tilted their head for you. Beautiful birds, lovely trees, incredible blue, blue skies and all perfectly captured for the day, Mick, as always!! Thanks for sharing and wishing you a great week!! I've had that experience with warblers which are always in the treetops and hard to identify from below. What a handsome bird. The trees and blossoms are pretty. 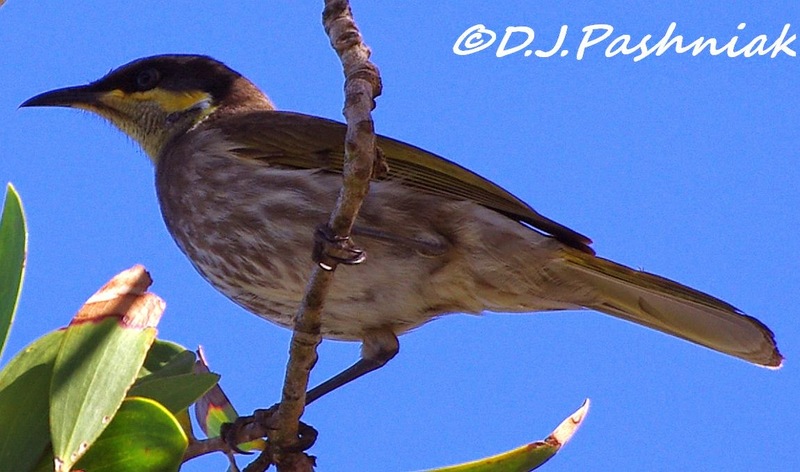 And great shot of your Mangrove Honeyeater.. Great photos, have a happy week! 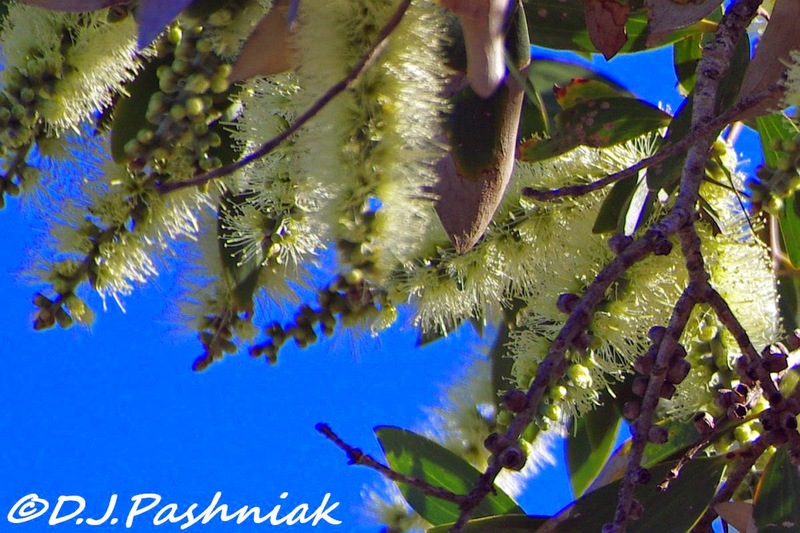 Really great shots of these birds and the Melaleuca flowers. I wish they would stop categorizing plants and just leave the Melaleuca's and Callistemons where they are though. Handsome fellows!! Boom, Bobbi and Gary. Beautiful trees and birds -- actually the 'view from below' could be a great help in IDing. Melacula (sp?) actually grows around where we live in Florida ... very well.. and there it is considered an invasive plant. It's a lovely tree there too, but I guess it is crowding out the natives. A lot I don't understand about invasives. 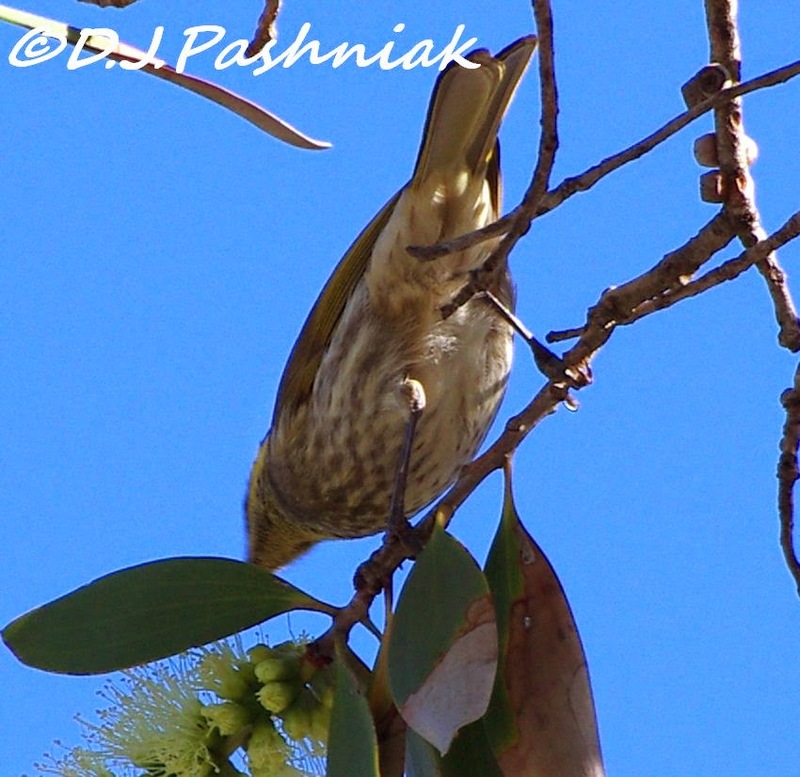 Beautiful photos of the honeyeater. Mick, you'll be getting 'birders neck' if you have to do too much high altitude photography!! Interesting info about the plants and definitely put a new slant on bird ID. Beautiful bird, Mick! This is the first time I've heard of this one. Lovely view from any angle with that gorgeous foliage, blue sky and lovely bird. Is this also known as the "tea tree"? Hi Karen, yes it's sometimes called tea tree (ti-tree) but proper ti-tree is Leptospermem and both are in the myrtaceae family. That's a bit technical - local and common names vary quite a bit!! I Mick Yes it is difficult to photo bird high up in the trees but you managed and I love the blue sky as well. Those birds like to test us out most times with underneath, brief or partial views. I often say birds would be easier to photograph if they didn't have wings! But nealry as much fun. Nice pictures! My heart sinks when I find out a bird is called "variable" - often means "basically, unidentifiable"! The flowers are great, but I really love that honeyeater. Pretty bird! What a lovely find in your yard!